Musheer Hussain, Edward Fisher, Jonathan Fishman,	The Journal of Laryngology & Otology, Volume 132 Issue 7, p 567. F López, J L Hunt, I J Nixon, A Rinaldo, M D Williams, A Cardesa, A Ferlito,	The Journal of Laryngology & Otology, Volume 132 Issue 7, pp 568-574. Cholesteatoma in children and adults: are there really any differences? R Jackson, A B Addison, P R Prinsley,	The Journal of Laryngology & Otology, Volume 132 Issue 7, pp 575-578. B Ersoy, B Aktan, K Kilic, M S Sakat, S Sipal,	The Journal of Laryngology & Otology, Volume 132 Issue 7, pp 579-583. Sinonasal papilloma: what influences the decision to request a magnetic resonance imaging scan? A V Kasbekar, C Swords, B Attlmayr, T Kulkarni, A C Swift,	The Journal of Laryngology & Otology, Volume 132 Issue 7, pp 584-590. E E Ross, S Anari,	The Journal of Laryngology & Otology, Volume 132 Issue 7, pp 591-595. B B Montaño-Velázquez, D A Lara-Sánchez, A Orozco-Sánchez, F J García-Vázquez, M R Mora-Campos, K Jáuregui-Renaud,	The Journal of Laryngology & Otology, Volume 132 Issue 7, pp 596-599. G de Bonnecaze, B Chaput, A Dupret-Bories, S Vergez, E Serrano,	The Journal of Laryngology & Otology, Volume 132 Issue 7, pp 600-604. 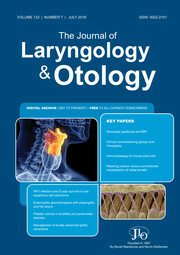 D D Maharaj, R S Virk, S Bansal, A K Gupta,	The Journal of Laryngology & Otology, Volume 132 Issue 7, pp 605-610. S A Schrøder, S Eickhardt, T Bjarnsholt, T Nørgaard, P Homøe,	The Journal of Laryngology & Otology, Volume 132 Issue 7, pp 611-614. Y Nakao, T Tanigawa, F Kano, H Tanaka, N Katahira, T Ogawa, K Murotani, T Nagata, R Shibata,	The Journal of Laryngology & Otology, Volume 132 Issue 7, pp 615-618. V Seccia, L Cristofani-Mencacci, I Dallan, S Fortunato, M L Bartoli, S Sellari-Franceschini, M Latorre, P L Paggiaro, C Baldini,	The Journal of Laryngology & Otology, Volume 132 Issue 7, pp 619-623. M Robinson, L Ward, H Mehanna, V Paleri, S C Winter,	The Journal of Laryngology & Otology, Volume 132 Issue 7, pp 624-627. S M Adnan Ali, M S Awan, S Atif, N Ali, Y Mirza,	The Journal of Laryngology & Otology, Volume 132 Issue 7, pp 628-635. R Mhawej, C Ghorra, S Naderi, N Khoueir, W Abou Hamad, A E Melkane,	The Journal of Laryngology & Otology, Volume 132 Issue 7, pp 636-641. R Smee, J R Williams, D P Kotevski,	The Journal of Laryngology & Otology, Volume 132 Issue 7, pp 642-650. L W Edelmayer, J E Fenton, S A Yellin, D J Shearer, D H Coelho,	The Journal of Laryngology & Otology, Volume 132 Issue 7, pp 651-656. A Mishra,	The Journal of Laryngology & Otology, Volume 132 Issue 7, pp 657-660. C van den Boer, A L Wiersma, J P Marie, J T van Lith-Bijl,	The Journal of Laryngology & Otology, Volume 132 Issue 7, pp 661-664. P Karthikeyan, D T Pulimoottil, R Sankar,	The Journal of Laryngology & Otology, Volume 132 Issue 7, p 665. E Sahin, D Dizdar, M E Dinc, A A Cirik,	The Journal of Laryngology & Otology, Volume 132 Issue 7, pp 665-666.